FlexiSpot, one of the fastest-growing manufacturers of ergonomic office solutions is launching a crowdfunding campaign on August 28 to introduce Deskcise Pro™– the world’s first sit-stand-cycle desk to backers worldwide. The experts have spoken. Prolonged sitting and standing are a no-no for optimal health. So, how exactly are we supposed to get things done in a healthy way these days? FlexiSpot, one of the fastest-growing manufacturers of ergonomic office solutions, has the answer. And, they’re launching a crowdfunding campaign on August 28 to introduce Deskcise Pro™– the world’s first sit-stand-cycle desk to backers worldwide. Part exercise bike, part sit-stand desk, Deskcise Pro™ is an all-in-one ergonomic powerhouse that checks all the boxes for keeping users active and productive throughout the day. FlexiSpot will pre-launch the product on Kickstarter in August with units expected to ship to backers sometime in the fall. Part exercise bike, part standing desk design lets you go from sitting to cycling to standing with one space-saving solution. A comfortable, height-adjustable seat that easily moves up or down to fit users from 5’1” to 6’2” tall. Whisper-quiet pedaling system that cycles smoothly without disturbing others working nearby. 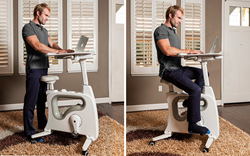 Full-motion desktop that adjusts up, down, forward, and backward to the perfect position for hanging out online, working, studying, or reading while you exercise.- Easy-rolling mobility to transport the desk bike from room to room with ease, plus gravity sensor wheel locks that keep it from moving while you cycle. 1-minute assembly is all it takes to attach the desktop to the base, then it’s ready to use. As an incentive for Kickstarter backers, FlexiSpot will offer Deskcise Pro™ to the first 30 backers for $299. That’s 40 percent off the retail price of $499. To pre-order at this exceptional price and learn more about the product that’s changing the way people work, visit FlexiSpot’s page here: https://flexispot.com/all-in-one-desk-bike/?utm_source=pr . FlexiSpot’s commitment to wellness at work and home drives the design of every sit-stand workstation, height-adjustable desk, exercise bike and ergonomic monitor mount it manufactures. The innovative R&D team is comprised of forward-thinking engineers who use the latest technology to turn their ideas into viable products that make productivity healthier in the office and home. Desktop size: 19.6" x 22.8"
Bike size: 35" x 23.2" x 42.5"- 48.4"
Height adjustable seat range: 29.7"- 37.2"